Per Father Henry Weisliewski, a consumer’s advocate for four decades, the ‘protective’ casket is perhaps the biggest rip-off in the funeral industry. Families are led to believe this rubber seal will keep water and biological entities out, therefore preserving their loved-one indefinitely. The gasket costs $12 to $20, yet the funeral homes typically charge $700+ more for a protective casket than a non-protective model. The truth is, this gasket can actually speed disintegration of the body by creating an anaerobic environment inside the casket, promoting the growth of bacteria inside the body that are generally unaffected by the embalming process. Gas build-up is a logical result, and has been cited as the cause of caskets literally exploding! For this reason, only non-protective caskets, or protective caskets with the rubber gasket removed, are allowed in most mausoleums. And what happens to that strip of rubber the family paid an extra $700 for when the body is put in a mausoleum crypt? Often as not it’s handed back to the funeral director to sell again! Specify a non-protective casket and save the family some money, perhaps enough to buy the monument. Lower-priced caskets are available, even from funeral homes. At last count, there were over 500 models of casket on the market for under $1000, but you’ll not likely find ANY of them in your funeral home’s showroom. If they have them on hand at all, don’t be surprised to find them in the basement, or in a dark hallway somewhere. They may be in unflattering color combinations (I’ve seen one in an army-green color, with a putty-colored interior! ), or full of scratches and nicks. Do not dispair, for just as is the case with all the other caskets, you won’t be using the one on display. 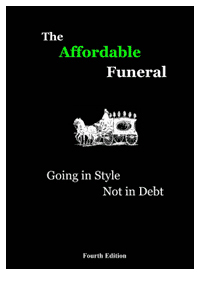 Any casket in just about any color you want is just a phone call away, so don’t buy into the ‘It’ll be a special order.’ dodge. They all are. If you don’t see what you want at a price you are willing to pay, ask to see their catalogs or call us. Better yet, check our online casket catalog.